The NDMC, which wanted to demolish the Super Bazaar building in Connaught Place to raise a multiplex, in a turnaround, told the Supreme Court today that it had abandoned the plan and was agreeable to revive the defunct super market as it is. Complaints about land grab and shady land deals, allegedly involving influential persons and even bureaucrats, have been on the rise here. This is attributed to the land boom which the region has been witness to since a couple of years. With 85 new cases of dengue reported during the last 24 hours, the total toll from the viral disease rose to 1,186 in the Capital today. Of the total number of cases, 766 are from Delhi, while the remaining are from the neighbouring states. 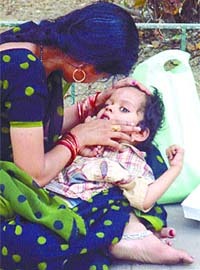 A woman trying to comfort her child, suspected of suffering from dengue, outside All India Institute of Medical Sciences (AIIMS) while awaiting her turn to consult with doctors. As many as 23 cases of dengue have been reported today, pushing up the cases to 68. There have been 212 suspected cases of the disease so far. A study reveals that the spread of the disease is in all parts of the city, including the posh DLF and Sushant Lok areas. 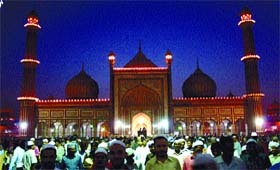 Festivity at Dusk: People mill around in front of Jama Masjid after breaking a daylong fast in keeping with the holy month of Ramzan. To ensure better urban development, the Central UPA government has already sanctioned Rs 50,000 crore under the Jawaharlal Nehru National Urban Renewal Mission for six years, said the Urban Development Minister, Mr Jaipal Reddy. After a struggle that lasted 26 years, teachers in the Jawaharlal Nehru University have finally won the right to have the elected representation in the University’s Executive Council. Delhi chief minister, Ms Sheila Dikshit, today said that the government would consider inclusion of the Right to Information as a subject in the school curriculum in the Capital. Taking seriously the municipal corporation election to be held in 2007, Congress MLAs and councillors today convened a meeting at the DPCC office and discussed various measures that would help the party in winning the polls. During the meeting, the leaders suggested that the government should pay special attention towards the people’s grievances. Delhi Chief Minister Sheila Dikshit seems to be in ruminative mood at a meeting with Congress counsellors to chalk out the party’s strategy for MCD elections next year. 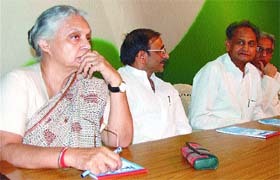 DPCC president Ram Babu Sharma and in-charge of Delhi affairs in the AICC Ashok Gehlot are seated along with her. The MCD today issued the fifth and final public notice on Supreme Court’s interim order providing relief to traders, informing them that they have to abide by the final decision of the apex Court, even as the BJP took exception to the issuance of such notices. Residents of Jal Vayu Vihar, Sectors 21 and 25, here have been taken aback by the Noida Authority’s decision to withdraw safai workers. The alleged withdrawal has been in effect since a fortnight. Speaking on the occasion of World Sight Day here today, the District Magistrate, GB Nagar, and Chairman of the District Blindness Control Society, Mr Vijay Chauhan, said the society would launch a campaign for motivating people for eye donation besides creating awareness about various eye ailments and cataract. A 24-year-old resident of North-East Delhi today lodged an FIR with the police alleging that she had been raped by her brother-in-law. The woman, staying in Gokulpuri, alleged that she was assaulted by the accused on the September 10 night when she was alone in her house, the police said. With the arrest of two persons – Mohan (30) and Sunder (29), the police today claimed to have solved 37 cases of bag lifting reported from Delhi, Noida, Ghaziabad, Faridabad and Gurgaon. Narcotic substance, a knife and a few ‘stolen’ bags have allegedly been recovered from their possession. The change in the NDMC’s stand came after the apex court during the last hearing had taken it to task for a defiant stand and sought details from the civic body about its plan, particularly about meeting the requirement of a large parking area for a multiplex in already congested Connaught Place. A Bench of Mr Justice B P Singh and Mr Justice Altamas Kabir took on record the statement of the NDMC counsel regarding the changed stand of the civic body, which owns the building and had earlier leased it out to the Super Bazaar cooperative society. But the Court directed the civic body to put everything in an affidavit. The counsel said the NDMC had a plan to set up a parking lot on the land near the building for the benefit of consumers who would come there for shopping. Mukesh Ambani-owned Reliance Industries group and a joint venture of Indian Labour Cooperative Society and Indian Potash Ltd had offered to bid for taking control of the Super Bazaar by putting huge investment in it. On behalf of the Union government, the Additional Solicitor General had put a proposal for reviving the Super Bazaar, once most popular marketing place for the middle class in the national Capital. The Reliance Industries has reportedly offered an investment of Rs 288 crore. The proposal to revive the Super Bazaar was made by the Union government after the apex court had asked it to explore the feasibility in this regard following a petition by hundreds of its workers in 2002 when the marketing complex was closed. The government was the biggest stake-holder in the cooperative with 50 per cent shares. The cooperative society has a membership of over 40,000, including those by its over 2,000 employees. The employees had resisted the proposal for winding up the Super Bazaar, once mooted by the Department of Consumer Affairs of the Union Government after the society ran into losses and the subsidy from the Centre was withdrawn. Reliance has purportedly offered to buy the shares of the cooperative with an offer of Rs 60 crore and create a working capital of Rs 85 crore for its smooth running. It reportedly plans to spend Rs 143 crore to expand the retail shopping like pharmaceuticals, fruits and vegetables, online shopping and institutional sales. The six-storey building has approximately 19,000 sq. ft covered area, which the apex court did not found fit for raising a multiplex with requirement of nearly 90,000 sq feet area for parking alone as per the estimates. A local advocate has now lodged a complaint with the police, demanding registration of a case against a Haryana MLA and his son for allegedly grabbing a piece of land worth several crores by preparing forged documents. The two, while making claims of being owners, allegedly sold the land. The land purportedly belongs to the Municipal Corporation of Faridabad (MCF). Colonisation is not allowed without getting the requisite sanction from the state government for change of land use. An application has also been submitted to MCF officials for information about the land under the Right to Information Act. The complaint has been submitted to the SSP’s office here. The complainant has pointed out the piece of land, measuring about four kanals and 17 marlas, is located in a nearby village. It is part of the “shamlat deh” (panchayat) land. Since there are no mutation records of this particular piece of land it comes under the MCF. The general power of attorney executed recently claims the accused is the permanent lessee. However, the revenue records reveal another person as the tenant and the MLA as the sub-tenant. The complaint says the land documents have been forged with the aim of earning a huge amount through colonisation. The complainant has made the plea that the matter needs an urgent and thorough investigation as it was “a clear case of cheating and forgery”. He has announced the Chief Minister will be apprised if there is a delay on the part of the police in taking action about the complaint. Meanwhile, several cases of cheating and fraud regarding land deals and the illegal sale of property have surfaced in the past several months. According to police sources, many of these disputes have been settled without taking recourse to legal measures. Certain officials dealing with the registration work of landed property have found themselves in the dock. Recently, there have been reports of registration of several acres of land being done through the manual process instead of the computerised one. The documents were allegedly prepared on a state bureaucrat’s behest through the manual process, probably to hide the identity of the land purchaser, claim sources in the local administration. The demand for checking unauthorised colonisation and development of residential colonies in the region bordering Delhi, especially Palla village here, has been gaining momentum. Thousands of labourers and daily wage earners have been sold land with basic amenities like roads, water, sewers and streetlights not being provided. Hundreds of illegal power connections, allegedly provided with the connivance of electricity department officials, besides unauthorised sinking of tubewells for water are the bane of this region. With 85 new cases of dengue reported during the last 24 hours, the total toll from the viral disease rose to 1,186 in the Capital today. Of the total number of cases, 766 are from Delhi, while the remaining are from the neighbouring states. The most affected areas are central, Najafgarh and Shahadra zones, an MCD official said. However, health experts said that majority of the blood reports of the patients received from laboratories had been found negative. An owner of a private laboratory in south Delhi said that he had examined 200 blood samples yesterday and all were negative. He added that there had been no dengue deaths reported since the past two days. Twenty-nine new patients were admitted to the All India Institute of Medical Sciences (AIIMS) and 39 patients were discharged since yesterday. “We have a total of 160 dengue patients in the hospital. No new cases have been reported from the AIIMS campus,” the institute’s medical superintendent said. Across the country, the number of dengue patients now stands at 3,962, while the death toll from the disease has reached 52. Dengue is caused by the bite of female Aedes aegypti mosquito, which breeds in clear stagnant water. The disease is marked by high fever, skin rashes and joint pain. A sharp drop in blood platelet counts can prove fatal. According to health officials, most of the people suffering from dengue in the Capital were below 25 years of age and the majority of them are children and male. In the past 15 days, around 1,500 units of platelets have been given to patients. “We have taken measures to ensure a regular supply of platelets. There is no shortage,” claimed a senior health department official. He said that measures had been taken to ensure that blood from the 53 licensed blood banks in Delhi was available for patients. A good number of cases have been reported from DLF, Jalvayu Vihar, Rajiv Nagar, Sector 14, Gandhi Nagar, Hira Nagar, Sanjay Colony, Mata Road, Carton Estate, Om Nagar, Khandsa Road, Hans Enclave, Wazirabad, Roshanpura, Patel Nagar and Saraswati Vihar. The health department apprehends more cases soon, going by the trend. The District Malaria Officer, Dr Krishan Kumar, lamented that the National Institute of Communicable Diseases (NICD) located in Delhi was slow in providing the cases sent from here for investigation. Meanwhile, the Chief Medical Officer, Gurgaon, Dr D.V. Saharan, claimed that the eight teams constituted for the purpose of fumigation and to spread awareness among the people, have already done several rounds of fumigation in the city. However, there are complaints of patchy work with regard to fumigation exercise conducted by the department in Sectors 14, 15, 31, 32 and some parts of old Gurgaon city Mr R.Jhandu of Sector 14 alleged that he had not seen or heard of fumigation conducted in the area where he stayed. The district administration and the HUDA have appointed nodal officers for taking remedial measures in the city. According to reports, almost all the hospitals in the city are flooded with patients reporting high fever and other symptoms relating to dengue. An officer of the health department, however, said that there were a good number of viral cases, but not all of them are dengue cases. The head of Pushpanjali Hospital, Dr S.P.Yadav, did confirm the large number of patients having viral fever turning up in his institute. Three more patients have succumbed to dengue while over three dozen new dengue patients were detected in Noida since yesterday, according to official sources. With this the number of patients has crossed 150 in GB Nagar. Private hospitals have confirmed 152 patients. Four in Noida and 18 in rural areas have died of dengue so far. In Fortis Hospital, 42-year-old D.K. Gupta of Hapur and another patient had died of dengue yesterday. Out of three dozen new patients, nine were from Ghaziabad while six from Delhi. In Dadr, however, the impact of dengue continues. One Dadri resident died in a Ghaziabad hospital while in Dadri, three other patients died, including a woman in different hospitals. All were confirmed dengue patients. Gagan Singh of Anika Road was admitted to Ganesh Hospital in Ghaziabad. He has breathed his last today. Pawan of Kathera Road, Dadri, Ruksana, and Bushan Lal are all admitted to Ghaziabad’s Ganesh Hospital. The dengue toll in Dadri has touched 15 now.Addl. CMO Dr A.K. Mishra, however, said there was no point in fogging operations during daytime as dengue hides in dark places. The mosquitoes can be killed by sprays and fogging in the open, he added. Holistic healer Sunil Kumar Garg claims that a decoction of ginger, lemon and honey can cure dengue. Mr Garg administered this decoction to 100 patients of dengue in three groups in different ratio depending on the loss of platelets. After every dose, the patients were given a glass of chilled juice of apple, pineapple or pomegranate without salt, Mr Garg said. “The results were encouraging, the platelets level rose from 12,000 to 82,000 in case of Sandeep Saini, who was brought in a serious condition. R.K.Bhardwaj, president of Krantikari Manuvadi Morcha, claimed that the decoction was administered to patients in Kailash Hospital at 5 pm, 8 pm and 11 pm on October 6 and the blood tests were done the next morning. About 70 patients were discharged from a Noida hospital on October 7 and 8 after they were cured. Once the platelet level starts going up with the intake of this decoction, the patient is on the way to recovery. All the patients discharged from this hospital have been advised not to take ‘mousmi’ or orange juice, leafy vegetables, beans, cauliflower, potatoes, arabi and milk, said Mr Garg. They were advised to take ‘kaddi’, chhah, rice, imli and imli ka panna, annar, apple pineapples, shakarkandi, besan products, sweet lime juice and kamrak for one month. However, nobody in Kailash Hospital including Dr Mahesh Sharma was available for comments or confirmation. He lamented that country’s most cities and towns were severely stressed in terms of infrastructure and services availability. In 2001, 50.3 per cent of urban households had no piped water within premises, and 44 per cent of them were devoid of sanitation facilities. Even with a relatively high economic growth registered during the 1990s, 23.6 per cent of the country’s urban population continued to be below the poverty line, added the minister. According to the census of India 2001, 14.12 per cent of urban population lives in slums, with a significant proportion of it does not have access to even the most basic services, added the minister. Mr Reddy has come here to inaugurate the annual zonal convention of the National Association of Students of Architecture (NASA) at Sushant School of Art and Architecture today. Out of the total Rs 50,000 crore, Rs 5,000 had been sanctioned for various cities which had submitted their master plans, informed the minister. The urban ministry had stressed for developing basic amenities like drinking water, sewerage line and drainage system for rain water in urban areas, added Mr Reddy. The Urban Development Minister agreed that Delhi was one of the cities of the country, where unplanned and unorganised urban development had taken place on a large scale. However, the UPA government would resolve the long-pending issues and provide the maximum relief to the masses. He further estimated that presently around 30 per cent population of the country lived in urban areas which would grow up to 50 per cent in the next 20 years. Population crossing 50 crore would live in urban areas after 20 years, said the minister adding that private developers and builders would play a key role for the development of urban areas in the future. Addressing about 1,200 student delegates who have come from nearly 26 institutes of architecture and planning, all across the north zone, Mr Reddy said that architecture was a combination of science and arts. The new ideas come from the new generation, said the minister, adding that the youth’s initiatives in taking part in architecture studies is a good sign for the country. The three-day event of the NASA would act as a congregation of the best of the architectural talents where students actively indulge in a variety of activities ranging from competitions, cultural shows, seminars and lectures, exhibitions, games and sports, etc informed Prof Ram Sharma, Director of the school. After a struggle that lasted 26 years, teachers in the Jawaharlal Nehru University have finally won the right to have the elected representation in the University’s Executive Council (EC). Instead of nominated members, the University will now have teachers electing their representatives to the highest decision making body. The recommendation to have elected members was first made by the JNU EC at its meeting in April 1980 and the Visitor, the then President of India, was forwarded a request that the existing number of three teachers of the University be inducted in the EC through direct elections, but was rejected in 1981. Subsequent requests were made to the Visitor in 1982 and 1983, but were again turned down. The issue was again taken up in 1990, 1991 and 1993. It was put forth that three teachers of the University, one Professor or Senior Fellow, one Associate Professor/Fellow and one Assistant Professor, should be elected by and from amongst the respective category of teachers through direct elections in accordance with the rules laid down by the University, provided that the faculty members holding the position of Rector or Dean will not be eligible for election. In 1990, the Ministry of HRD had appointed a Committee to look into the matter regarding representation of teachers and students in various bodies of the Central Universities. Finally in October 2006, the President of India, in his capacity as the Visitor of the University, gave his assent to the amendment to Statute 13(1)(vi) of the Statutes of the University, regarding representation of three teachers of the University in the Executive Council through direct election. Amendments to Statute 13(1)(vi) concerning teachers’ representation on the Executive Council have been made. As against the existing Statute 13(1)(vi), which provides for three teachers of the University nominated by the Visitor on the recommendation of the Vice-Chancellor, there will now be one Professor/Senior Fellow, one Associate Professor/Fellow Chancellor and one Assistant Professor elected by and from amongst the respective category of teachers, through direct elections in accordance with the rules laid down by the University. Provided further that the faculty members holding the position of Rector or Dean will not be eligible for election. “We are very happy that the demand has been met. Electing representatives is a democratic way and this will further strengthen our functioning. The process will also introduce more checks and balances,” Dr Rupamanjari Ghosh, president of the JNUTA, said. The RTI would also go a long way in empowering and strengthening the democratic system, she said, adding that her government had made available all useful information on website and had implemented e-governance and computerisation. Ms Dikshit pointed out that the involvement of NGOs, trader associations, and the RWAs in ‘Bhagidari’ workshop had resulted in transparency and openness. Moreover, the RTI had been able to curb corruption, she added. “The days of working behind the curtains are over and people expect more and more transparency and accountability,” the Chief Minister pointed out while expressing confidence that students of Delhi would take a lead in disseminating the true message of the RTI Act. Ms Dikshit was speaking at a prize distribution function to felicitate the winners of an essay competition for school students on RTI jointly organised by the Directorate of Training and Directorate of Education. Presenting awards to the winners, she said that it seemed that the message of the RTI Act had since reached the common man, as first three positions in the competition were secured by girl students from the schools situated in slum and rural colonies. It was mentioned that the response to the essay competition was overwhelming, as more than 2,627 students participated from 914 government and government-aided schools being run by the Directorate of Education. Kumari Neelam Singh from Government Sarvodaya Kanya Vidyalaya, Nangloi secured the first place, while Kumari Poonam Saini from Government Girls’ Senior Secondary School, Najafgarh secured the second and Kumari Pratibha from Government Girls’ Senior Secondary School, Nand Nagri secured the third position. On the occasion, the Chief Information Commissioner, Mr Wajahat Habibullah, described RTI as a major step in democratising the polity of India. He said that the RTI Commission had been receiving complaints from all sections of the society, including slum dwellers that reflected that the people have come to know about the utility of the RTI. Mr Habibullah requested the Delhi Government to integrate two Acts – Central RTI and Delhi RTI. Former Union Home Secretary, Mr Padmanabhaiah, who presided over the function, exhorted NGOs to render constructive cooperation in making RTI more purposeful. He added that RTI was bound to bring in greater transparency and openness apart from changing the mindset of the people working in the government. He described RTI and consumer courts as two major positive developments after Independence. Taking seriously the municipal corporation election to be held in 2007, Congress MLAs and councillors today convened a meeting at the DPCC office and discussed various measures that would help the party in winning the polls. During the meeting, the leaders suggested that the government should pay special attention towards the people’s grievances like water and power crisis and the issues like tax on ground water. They also raised the issue of demolition and sealing which has affected most of the traders in the Capital. Virender Kasana, a councillor, opposed the Delhi Government’s proposal to levy tax on ground water saying that everyone had the right on ground water. Appealing to the DPCC Chief Ram Babu Sharma and in-charge Delhi State Ashok Gahlot, he said that the government should be pressurised not to table the proposal in the coming Assembly Session. He also accused the government of not supplying sufficient water to the citizens. Even in the Delhi Jal Board meeting, Congress MLA, Mr Bheesham Sharma, opposed the government’s decision to levy tax on the ground water. “Ground water level in seven out of nine districts is low. But new tax cannot raise the water level,” he said. The fifth notice informs the shopkeepers, who were provided relief under the September 7 and 15 notifications, that they have to abide by the final court order. The notice also said that such traders would have to submit an affidavit in this regard promising that they would abide by the court order. The civic body has already issued four notices in the last two days informing public about the September 29 order proving complete relief to small shopkeepers and partial relief to traders who were exempted from the sealing drive under the two notifications. The Supreme Court has asked the MCD on Tuesday to spell out its sealing action plan and the civic body has informed the apex court that it would be issuing public notices in that regard. The sealing drive was stopped after traders bandh turned violent on September 20. Meanwhile, the opposition BJP has raised the pitch against the notices saying it added to the confusion. That the Noida Authority should have resorted to this when the region is coping with the combined dengue, chikungunya and malaria onslaught has shocked the residents. With utmost cleanliness being the need of the hour, the ground reality is quite horrifying. The sector roads have not been swept since 15 days. There are heaps of waste in this posh defence sector. Some senior serving and retired officers from the Air Force and Navy reside here. The Vice-Chairman of the Jal Vayu Sehkari Awas Samiti, Group Capt S. N. Dogra, alleged that when he questioned health officer R.S. Yadav about this his response was “There are instructions from higher-ups”. Noida Authority officials, however, have informed mediapersons no safai worker has been withdrawn from Jal Vayu Vihar. But then there are no answers to why the area is dotted by mounds of waste. The security staff posted at various gates of the area have also confirmed they have not seen any safai worker since a few days. Speaking on the occasion of World Sight Day here today, the District Magistrate, GB Nagar, and Chairman of the District Blindness Control Society, Mr Vijay Chauhan, said the society would launch a campaign for motivating people for eye donation besides creating awareness about various eye ailments and cataract. Children will be the special focus of this campaign. He said GB Nagar had taken the lead in Uttar Pradesh for cataract operations. Mr Chauhan also launched an eye donation programme. Earlier, Dr Sushil Chaudhry of ICARE Hospital, Noida, said last year 26,400 corneas were collected but the requirement was for 140 million countrywide. Twenty lakh of these were needed for children. Anyone desirous of donating one’s eyes could call up 1919. He said there were 180 million visually handicapped people in the world. A 24-year-old resident of North-East Delhi today lodged an FIR with the police alleging that she had been raped by her brother-in-law. The woman, staying in Gokulpuri, alleged that she was assaulted by the accused on the September 10 night when she was alone in her house, the police said.